April 05, 2019: The West Bengal Board Exam authorities are divided in two sub-divisions; the West Bengal Council of Higher Secondary Education (WBCHSE) which handles the HS or Class 12 exams and the West Bengal Board of Secondary Education (WBBSE) which is the governing authority for the Madhyamik or Class 10th exams. Both councils have announced the dates for the examinations for class 10th and 12th in West Bengal. The WBBSE will be conducting the Madhyamik or Class 10th exams from the 12th of February 2019 till the 22nd February, 2019 and the WBCHSE will be conducting the class 12th examinations from 26th February, 2019 till 13th March, 2019. The results for both the exams are expected in the month of May 2019. The timetable for the Madhyamik exams, conducted by the West Bengal Board of Secondary Educationcan be found here and those for the HS exams can be found here. Last year, the WBCHSE laid down five commandments violation of which could lead to a candidate being disallowed from giving the HS exams. The five don't as listed by the council including carrying a mobile to the exam venue, misbehaving with invigilators, rampaging inside the exam halls, cheating, and carrying an answer sheet outside the examination hall. The West Bengal Board of Secondary Education (WBBSE), earlier last month, also announced the use of GPS strips or digitally-intelligent stickers to seal question paper packs and prevent leakage. The sticker, due to the use of GPS strips, will alert examination officials if the envelope with question papers is cut open. Stricter laws and policies may just affect the WB result 2019. In an unrelated decision, the council also now publishes the question papers for some major subjects in English, Hindi, and Bengali. In the last year, the WB results were announced in June. This year, too, the West Bengal board result 2019, is expected to be announced around the same time, tentatively in the last week of May. We will update the exact time and date as soon as the information is released by the official authorities. Other information we release will include name-wise results, pass percentage, number of candidates, gender-wise pass percentage, names of toppers, etc. We will publish the WB Madhyamik Result 2019 and the West Bengal HS Result 2019 on our website, examresults.net/wb/. 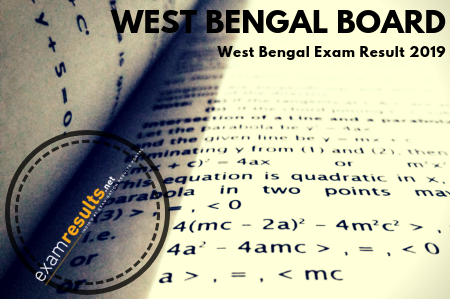 The results are also announced through the official website of the West Bengal board. The West Bengal results are also announced through the official website of the West Bengal board, and will also be available on our recently launched Android app. Click on the link and fill in your details, including Roll Number to get your West Bengal Madhyamik 10th Class Result 2019. Another way to check your West Bengal result 2019 is to download the ExamResults Android app, and stay updated about all the latest exams- and results-related notifications. If you trace the history of results announcement in West Bengal, the exam results are generally announced in the month of May. Last year, both, the Madhyamik and West Bengal HS Result 2019 were announced in the June. This year, there is chatter that the dates for result declaration will be around the last week of May. 11 lakh students sat for the Madhyamik and HS exams held by the West Bengal board in 2018. In the year 2018, the overall pass percentage of students who appeared in the Madhyamik exam was 85.49% and for the HS exam was 83.75%. In the table below, you can check the pass percentage for the past two years for both, the West Bengal Madhyamik Exam and the West Bengal HS exam. We will update this table with the pass percentage for 2019 once the results for this academic year are out. Students appearing for the West Bengal Madhyamik 2019 and West Bengal HS exams 2019 can check their results on the official websites of the governing bodies conducting the examinations, wbbse.org and wbchse.nic.in or on examresults.net. The West Bengal Board of Secondary Education (WBBSE) was established in the year 1951. Currently, there are 10,238 schools in West Bengal that are affiliated to WBBSE. The West Bengal Government established the West Bengal Council of Higher Secondary Education (WBCHSE) in the year 1975. The head office of WBCHSE is located in Salt Lake, Bidhannagar, Kolkata and has 4 regional offices across West Bengal.